A Cease and Desist Letter can help you request that another person or business stop an activity that is harassing or infringing. It states that they will be given a certain amount of time to voluntarily stop or you will take legal action. You want to formally tell someone to stop harassing you. You're a victim of copyright or trademark infringement. You are a victim of patent infringement. You want to stop a breach of contract. Someone is plagiarizing your work. You need to stop property or boundary disputes. Cease and Desist Letters only require a bit of information to make using Rocket Lawyer. The burden of the work is on you do prove that a violation has occurred or that you are being harassed. Gather as much documentation as you can to support your claims to help prove your case should you end up going to court. 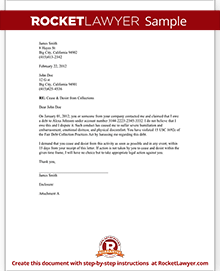 A Cease and Desist Letter is used to attempt to stop an activity before legal action is taken. The activity may be harassment of you or your business, use of your copyrighted or trademarked work, or excessive actions of a debt collector. The letter explains the offensive activity and asks them to voluntary stop. It gives them a time frame for responding and relates that further legal action will be taken if they do not desist. There are four common reasons that Cease and Desist Letters are used including harassment, copyright infringement, trademark infringement and collection agency harassment. If you're unsure about whether a Cease and Desist Letter is right for your situation, ask a lawyer. 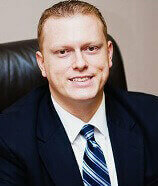 Harassing behavior may include character assassination, slander, libel and defamation. Harassing behavior may include repeated phone calls, uninvited visits or negative comments to other people. Harassment may be personal or directed towards your business. Before sending a Cease and Desist Letter, you should document what you have done so far to stop the harassment. Also, document instances of harassment should you need the information later. Some examples of work that may be protected by copyright include art such as music, graphics, sculpture, video or audio productions and literary writing. To be protected, the art must be original. Software and apps are also usually protected as well as original web content. If someone is using your work without permission, you'll first want to ask them to stop using a trackable method such as an email. If they continue to use your work or do not respond, then you may choose to send a Cease and Desist Letter. Include, with the letter, documentation that proves you own the copyright or created the original work. Trademark and patent infringements are often more easily enforceable and to prove. If you end up in court, you'll need to prove you own the mark and that the good or service offered by the offender could possibly be confused with your trademarked or patented product or service by consumers. Or, that the offender's product or service is diluting your trademark or patent by distorting the distinctiveness of your product. In this type of situation, you'll want to carefully document any communications you have with the offender and start building your case to prove that their actions hurt your business. Since a lot may be at risk, you should have a lawyer review the letter before you send it. Even if you owe the debt, you still are protected from harassment. Protection from harassment is outlined in the Fair Debt Collection Practices Act (FDCPA). Examples of harassment from collection agencies include phone calls that abuse or harass any person answering the phone, profane language, threats, publishing non-payment information and calling without identifying themselves. They should not call before 8 am or after 9 pm and cannot visit your workplace. The disadvantage to sending a Cease and Desist Letter is that they may decide to pursue other legal options. However, it may be to your advantage to send the letter if the statute of limitations has expired or the debt is not yours. What information is needed to write the letter? With this information, the letter is automatically generated. Once the letter is created you can edit and share it online. You can also choose to print it or download it. You should keep a copy for your records. Do I need a lawyer to send a Cease and Desist Letter? You can create this letter yourself using Rocket Lawyer. However, if you need a Cease and Desist Order, you need to file a lawsuit or other court action to request the court to order the individual or business to stop the action. Often this step is taken if you've received no response resulting from the Cease and Desist Letter. How should I send a Cease and Desist Letter? You'll want to send the letter in a traceable manner. You could pay a process server to deliver the letter in person and require a signature, or you could send it by certified mail with a signature required. Or, you can send by certified mail with a return receipt. This shows that the letter was delivered, or delivery was attempted. This type of delivery is suitable if you think the recipient will refuse to sign. You can also send it by email, fax or standard mail to show your due diligence. You should save copies for yourself and your lawyer. Our step-by-step interview process makes creating a printable Cease and Desist Letter easy.